Growing cucumbers how do experienced growers and newcomers alike. Depending on the method of cultivation will vary the care of these plants, but it is necessary to consider the need for plants with special temperature regime, moisture and timely watering. Cucumbers come from the heat of India, so to get good crop you want to create for them the conditions appropriate tropical. When growing in the open ground to make it happen is not easy, so growers have to go to various tricks to protect tender plants from the cold dew, North wind, rain, pests and diseases. For growing cucumbers without a greenhouse is great warm manure bed. To do this, at the end of April – early may, the gardeners put the manure from the cattle in a stack with a height of 70-80 cm, shed water and covered with a dark film. In these conditions the fermentation of biological material, manure is heated to 55-60oC. In such circumstances, killing all pests, and nutrients after fermentation, are available for the roots of cucumbers. In addition to the excellent food in such a bed for cucumbers maintains optimal humidity and temperature. If it is not possible to use manure, you can replace it with compost from weeds or hay, but in this case, instead of water you need to use warm urea solution, to accelerate the maturation of compost. The appearance on the dung bed of white mushroom and then the mushroom means that the inside temperature which is optimal for planting cucumbers. 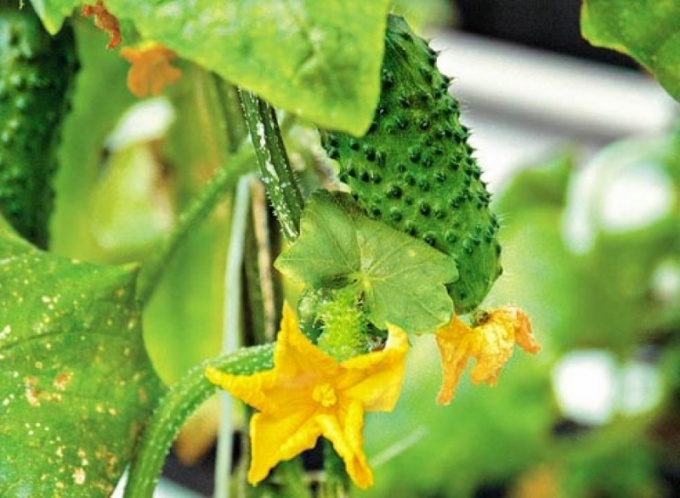 Can be planted as pre-soaked seeds and seedlings of cucumbers, but it is worth remembering that these plants do not tolerate root damage, so the seedlings should be planted in separate cups. For weather protection bed cover with film or non-woven covering material. Water the plants better in the evenings, after 18-19 hours local time. At this time the plants are most receptive to watering and the intense heat anymore. Water until the morning time to soak into the ground, and the drops of dew be dry, causing burns on the leaves. In the morning and afternoon to water the cucumbers are not recommended, since in this case the water evaporates quickly, without having to reach the roots, and the film night condensation that leads to the development of various diseases. Cucumbers require a daily watering abundant, especially if there is hot dry weather. For irrigation you need to use a funnel with divider, to produce the glaze all over the garden, including plant leaves and the soil around them. Better to use warm water heated in the sun, because the water is cold and the roots of cucumbers die off. If strong heat, it is possible additionally to arrange on the cucumber beds capacity with water – evaporating water increases the humidity, which is beneficial to plants. If the temperature dropped and it began to rain, daily watering is not required, but you need to monitor the condition of the soil and water the cucumbers as needed. Waterlogged soil leads to root rot and growth of fungal infections. The soil around the roots need mulch humus or peat to prevent them drying out and to retain moisture. Taking into account all the features that you can generate a good yields this capricious culture.